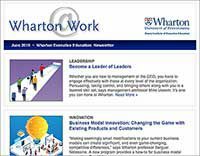 PHILADELPHIA, PA, Feb. 19, 2015 — The Wharton School of the University of Pennsylvania joins Women’s World Banking to announce the Leadership and Diversity for Innovation Program, which will launch in April 2015. 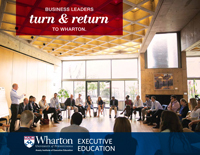 Wharton faculty will facilitate a three-day CEO/senior executive forum in New York in April followed by a three-day CEO/senior executive roundtable in India in September, coinciding with a one-week long leadership program for the women leaders. Creative Metier, internationally-recognized experts in remote coaching delivery and financial inclusion will provide executive coaching support to complement the in-person trainings throughout the year. More than one billion women globally do not have access to financial services. At the same time, women are the fastest-growing, most dynamic market segment in the world. Organizations seeking to narrow the gap in financial inclusion–and win a share of this market–must be leaders in innovation. Research conducted by Women’s World Banking shows that most executives in financial institutions serving low-income clients receive little or no leadership or management training. The executives surveyed understand that mastering effective leadership, including building a diverse workforce, developing talent, expanding product offerings, planning for succession and redefining organizational culture, is essential if they are to keep pace with innovation and deliver on the double-bottom line. Women’s World Banking’s Leadership and Diversity for Innovation Program exposes participants to the latest business practices and thinking to help them build a sustainable future towards serving low-income populations with financial products and services. It’s a future that increasingly must address the needs of women. Participating financial institutions provide critical services, including credit to start small businesses, insurance and savings programs. But, many of these institutions face rapidly changing market dynamics that are forcing leaders to rethink their business models, from the convergence of non-profit and banking for low-income clients, to the rise of mobile payments that is transforming how people do financial transactions. Women leaders will focus on individual development to best contribute to the organization by honing their visioning, negotiation and strategic relationship-building to achieve impact. Participants will work together to address how to best serve the women’s market through customer-centric innovation. At the end of the program, participants will have enhanced their critical and strategic thinking skills, and will gain a laser-like customer focus making them better equipped to make leadership decisions. To learn more about Women’s World Banking and the Leadership and Diversity for Inclusion program, visit https://www.womensworldbanking.org/leadership. Creative Metier specializes in supporting senior leaders and their organizations, which often operate in highly complex environments, to resolve the most challenging issues they face. Working in Executive Coaching and Mentoring, Senior Leadership Development, Strategic HR and Organizational Development, our approach is always respectful, long term and consultative. Headquartered in the UK, Creative Metier works globally and delivers remote coaching to senior leaders in Africa, Asia, the Middle East and Latin America. Committed to working at global and regional levels to expand financial inclusion, the aim of Creative Metier’s work with financial institutions, service providers to the sector, industry bodies and regional donor programs is to substantially increase the impact of their work.